In the 1920's a new breed of women was created-the flappers. These women wore short skirts, cut their hair and generally disregarded society's preconceptions on how women should act. These women were considered brash by the people of the time as they drank in public which was previously prohibited, smoked, drove fast cars, and smoked. Women also openly took on lovers, something which shocked the world. 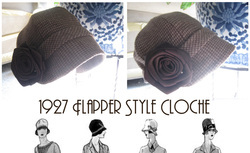 The flappers changed female clothing drastically. The flappers made a huge impact on the style of dresses which in some aspects changed to better suit the women who wore them to dance to popular American Jazz. Some flapper dresses had slits runnin down the side of the skirt to enable more freedom when dancing. The waistline of the dresses that flapper women typically wore tended to hang to their hips rather than settling onto the waist. The clothing in general was more baggy and skirts tended to be shorter. The flappers were the ones responsible for the removal of teh corset from women's clothing, they also preferred to wear bras which pulled in their chests creating a somewhat flat chested appearance. This enabled them to have more freedom in movement as their breasts would not move about when dancing. The corsets that flappers introduced made the female body apear more straight as it did not accent the hips and waists as previous corsets did. Flapper dresses were straight and loose, leaving the arms bare with, in some cases, no straps at all. Skirts rose to just below the knee by 1927 this allowed flashes of leg to be seen when they moved. Popular dress styles were those which took the form of a robe and hung straight down. Despite the general scandal that the flapper style created, their look eventually became fashionable even among respectable older women. In a toned down style, these women introduced aspects of flapper fashion into their lives. It is due to the flappers that the short hair that is favoured by the elder generations is around. The style of short, messy hair that still looked styled was what the flappers chose for their hair-do's. Boy style cuts such as the Bob cut, Eton crop, and shingle bob were especially popular. Finger Waving was a major method of styling. Hats were a required accessory that every flapper had to have. The hats were, in some cases, very masculine and always close fitting. Popular hats included the Newsboy cap and Cloche hat. The flappers wore jewelry that lacked the refined and elegant design of previous fashion. Some examples of popular jewellry included many layers of heavy beaded necklace, rings with large stones and pins and brooches which came int style. Horn-rimmed glasses were also a popular accessory. Originally, the paler your skin, the more attractive you were. The flappers however found that tanned skin was more their style. This came into fashion when Coco Chanel developed a tan after spending too much time in the sun when on holiday. The tan suggests a life of lesuire and what flapper women wanted most was to look fit sporty and healthy. Flappers wore 'heavy makeup' rather than what was previously viewed as acceptable. The invention of metal lipstick containers as well as compact mirrors assisted with the application process for their makeup. Dark eyes, especially Kohi rimmed became in style and blush increased in populairty as it was no longer a hassle to apply. The flappers wore silk or rayon stockings that were suspended by garters. In some cases they allowed these stockings to hang low in a controversal manner. High heels also became popular due to the flappers and reached 5 to 8 centimeters in height. The 1920s Flappers has left a historical mark on history and the modern "flappers" can be seen at present. The Flapper was not just a spunky rebellious young woman who strove to defy her mother’s traditions and caused uproar in society (although she certainly did so along the way). Rather, the Flapper was, and still is, the key symbol of the loud, modern youth of the 1920s. Her frankness about sexuality created both a new emotional and sexual culture for women, and a new foundation for male and female courtship. She shook the social norms and rocked the traditional female roles. She showed women across the globe that being submissive could only harm the potentially remarkable female. More than anything else, however, the Flapper created a new youth identity, not only in the United States but also in Europe and Russia. The older generation was all well familiar with the “Flaming Youth” and its dare to be free.